Hello! Boy it has been a busy day! I spent my entire morning cooking (which I hate to do) at my daughter's school for a dinner they are having tonight at the church. We had to make baked ziti for 125 people! Guess who showed up to help? Pretty much my BFF and I! There were two others who helped for short periods of time, but for the most part it was the two of us. Talk about tiring. I already told my hubby, do not expect me to cook tonight lol! Then I made the rounds, picking up the kids, got home, got them down for their naps, and sat down to make a card! This is for today's sketch challenge on SCS. I used this adorable Penny Black image that I borrowed from my mom. I stamped it twice, colored it in with Copics, cut out the balloon and flowers, and popped those up on foam squares. I layered the image panel onto some Rose Red cs with and added a scalloped edge. The sentiment is from MFT You Take The Cake, and I cut it out using my Ribbon Tag Trio Shapeabilities. I sponged Cameo Coral over the sentiment tag and added the Kiwi Kiss ribbon. The dp is from SU Raspberry Tart DSP. I added a zigzag stitch between the strips with my sewing machine, and put white brads in the corners. I hope you like it, and thank you so much for stopping by! Very cute! Love this sketch, I hope I get to play also! All your cards are sweet. that is awesome! I love that! 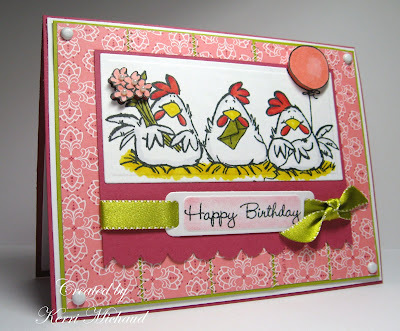 I'm going to have to look into getting me a chicken stamp like that. So cute! Absolutely adorable!!!! I love the depth you've given to the flowers and balloon!